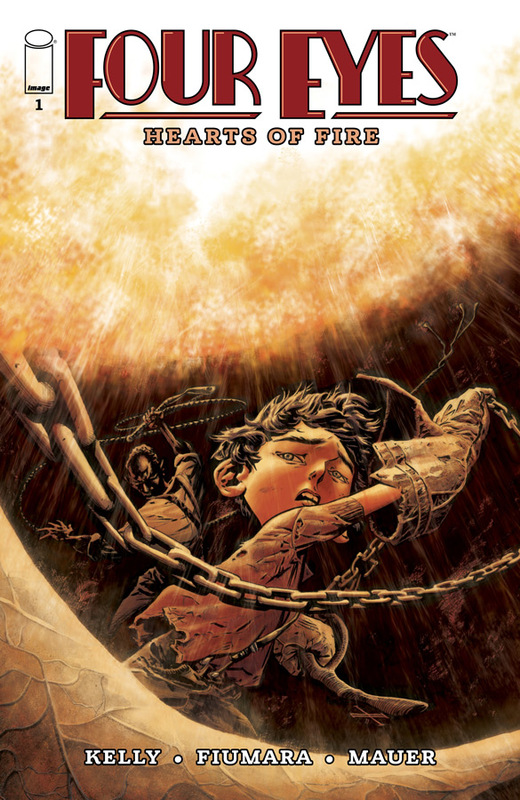 The Fellowship was fortunate enough to obtain a copy of FOUR EYES: HEARTS OF FIRE #1 from Image Comics. Joe Kelly writes, Max Fiumara draws and colors, and Thomas Mauer letters. Enrico may be young, but it’s the Great Depression, so he works. As jobs go, his is a pretty cool one – he is the keeper of a baby dragon he calls Four Eyes. But in Chicago there’s only one use for a young dragon, and that’s in the fighting pits. Enrico’s boss is not a nice man, but this is only the beginning of Enrico’s journey into the dark underworld of dragon fighting. There’s a lot going on in Enrico’s world. Mister Fawkes runs in some wide-ranging circles, and they mostly seem to include some not-very-nice people. And I don’t think Enrico will give up on Four Eyes so easily. And then there’s clearly something going on with his mom. So there’s plenty of story to go round here, and the way the art contrasts between the use of darkness and intimate detail is just fantastic. The Depression is a really interesting choice for setting; it adds more layers to the world around Enrico, for sure. This issue is a great place to jump in and experience this world for yourself. FOUR EYES: HEARTS OF FIRE #1 is available now at your FLCS or at imagecomics.com.